Over the last few weeks, things feel as though it’s been a world wind of events. I'm fortunate with my new job; I have the most amazing and supportive manager, who allowed me to complete admin work from home, was productive and allowed me to go away on holiday. The last two weeks has meant my holiday posts will have to wait, but I'm still writing them. I've completly left call centers work because of the various issues, but mainly to do my hearing. My new job is an activities coordinator working in elderly health care faculties. I have worked as a care assistant and studied to become a surgical nurse and I am familiar with research-based practices. My manager wants to adapt and use evdience based practice, for me it meant copious amounts of research. This role has meant more admin work than, I realised, and I only work three days a week, which is great at the moment because I have so much going on in my life. I’ve contemplated and reached a decision to get the activities programmes fully operational, I need to engage more time at work. I’ve opted to work full time for the next month or so. At the moment, I feel disappointed, frustrated and feel that I’ve made little impact. Due to various things going on at the home, which I won’t mention, but things have been tempestuous, I want to change that and create some stability for the residents. I have decided to stop volunteering at the library and attending my knitting group to focus on work for the time being; it’s something I am not happy about; unfortunately, needs must. Even though, I’ve just starting knitting my first beret and using my first pattern. I was excited, I’ve met someone through the couch surfing community, it's wonderful to meet some new. I've wanted to meet new people particularly more women, as I know more men than women it's nice to be able to talk about female things like fashion and bags lol, or crafting. We went to a local Turkish café for tea and köfte wrap (köfte is minced meat mixed with spices and onions), it was so tasty. We looked around the town to a few of my favourite places, then bag browsing at expensive bags and ended up my favourite tea café. The cafe all the tea's are served in a teapot; I had mango Royal tea blends she ordered milk oolongs. It was fun, and we agreed to meet up soon. I went shopping in Primark to look around since they're starting to stock their autumn and winter clothing. I apologise for the poor photos I've lost my mobile and couldn't find my camera. I found two top for £3.50 I loved this one as I loved the colour with star patterns; I love stars and the colour it's a mauve colour than grey, poor quality camera on my tablet. 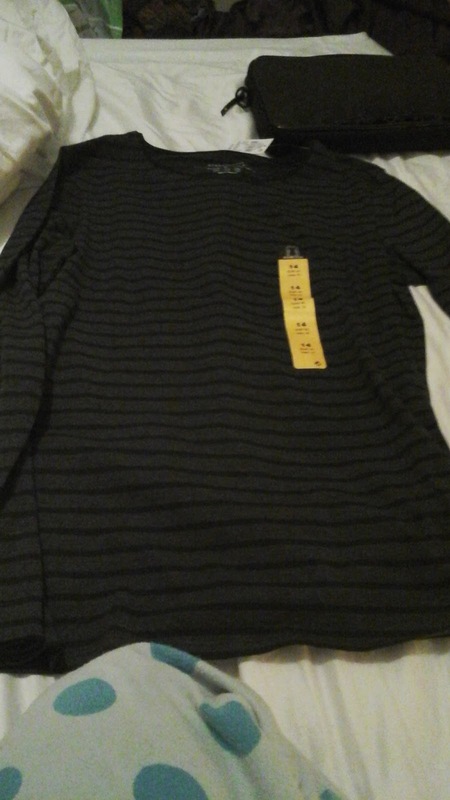 I loved the grey and black stripe pattern, unfortunately, I didn't release the top were a cotton and polyester blend, I hate anything polyester even if it's low as 20% the tops are quite thin and I probably will wear vest top underneath. I avoid buying Primark shoes but I had these style of shoes before reasonable quality and for £6, I can't complain. 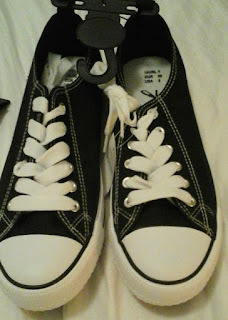 I wanted to purchase a pair of converse but can't afford it at the moment. I Bought a new netbook bag for £6.99 from eBay, as my current one was starting to get tatty, but is harbouring the smoke of smell and difficult to clean. I remember seeing this same one a few year ago when I went back to purchase it they were all gone. I love that pattern! So far I'm only brave enough to sew pillow cases :p That and I haven't devoted the time to practicing. I completely understand the temptations of the season. One thing that works for me is when something comes in the house, I try to make a point for something to go out. It doesn't always work though. Sorry you had to quit your volunteer position at the library. Sounds like work is pretty consuming right now though. Hope it all works out! I loved sewing and learnt to sew from the age of 21, I tend to make most of my long skirts due to my height and shape I mainly use the same pattern lol. I'm reasonable in comparison to my Mam and Gran, who were professional machinists. I 've been quite good and got rid of a lot of stuff, but I went into the bargain shops and seen a the Halloween Bottles And decor. Work is going to be consuming for the next few weeks even months; I need to devote the time to get things organised. There was meant to be two of us, but she hasn't started, when she does it'll make life easier. In regards of the library, I haven't quit the library yet but just told them work going to be the main focus. My manager has organized a timetable to work which will improve things. I have a few things going on for another charity I volunteer for to write their newsletter. Wow Sarah you have been busy, I can understand I can understand why you've had to wind in some activities. Starting any new job is stressful, and while yours sounds like a very worthwhile thing to do, having spent a lot of time in care / nursing homes visiting a relative for 5 years I know they can be pretty strange, stressful environments dealing with often confused elderly people. Sounds like a good clear out was had, the top with the stars is so cute. Yeap, I've had to cut things down somewhat, just until the activities programmes up and running. To be honest, I feel more in my element within healthcare, it's an eternal love-hate relationship It's very much my passion and the only thing I know and understand. I find work with people with dementia enjoyable, especially the stories they conjure up is incredible at times. The fact my short term memory is rubbish help and insanity help. Health Cares my passions and it nice to work in it within a different capacity. My clear out was very fruitful. Hopefully, I'll continue to declutter, lol. 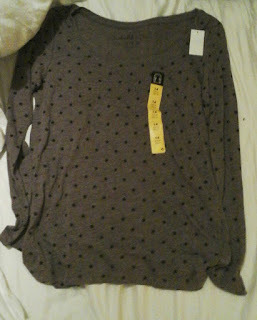 I totally agree about the top being cute, couldn't resist purchasing and for £3.50, it not too bad. Have an amazing writing retreat, you're in a beautiful and inspiring part of the world. I look forward to meeting you for a cuppa. Shame you have to give up the library and knitting and such, but hopefully you'll be able to get back to it once you get the work stuff under control. I'll be looking forward to your seeing what you make from Madame MM's recommended pattern - it's a cute one! I wore that top yesterday it was really comfortable with a cotton vest top underneath it, I am not bad with 95% cotton and 5% spandex anymore and I can't wear it as my bodies feel likes it's being suffocated. 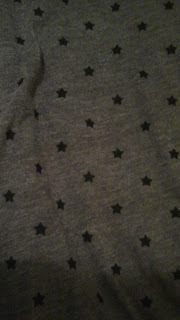 I love stars to, especially the small ones, I am not keen in large star patterns as they look garish.